Looking for an awesome Sugar Scrub? This sugar scrub recipe is perfect for smooth, soft, summer skin! 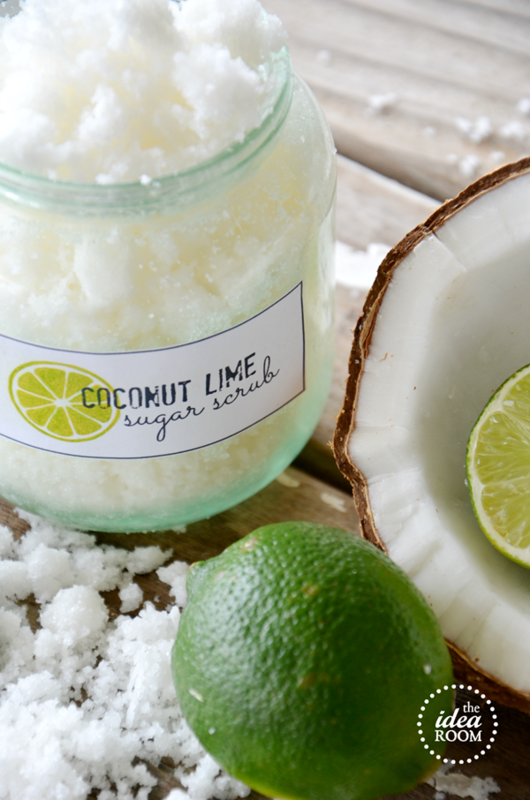 You will love our Coconut Lime Sugar Scrub recipe! Great gift idea too! With Mother’s Day this weekend, it’s time to start thinking about gifts for the special women in your lives. Now, I don’t know about you…but as a Mother myself, I prefer gifts that are of the pampering kind and a good sugar scrub is always welcome. I have been obsessed with using DoTerra Essential Oils and just got some Lime oil. It smells AMAZING! 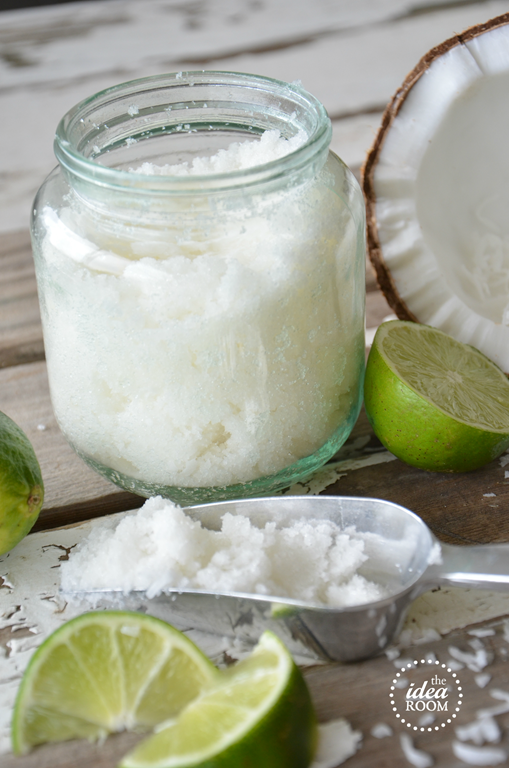 So…I made a Coconut Lime Sugar Scrub. If you have been hanging around The Idea Room, you have been aware of my Sugar Scrub obsession. At the bottom of this post, I will share with you my entire collection of Sugar Scrubs so that you can take a look at them if you are interested. Since my food allergy diagnosis, I have incorporated Coconut Oil as my main cooking/baking base and I am in LOVE with it. It is the perfect oil to use in this scrub because it has a slight scent and leaves the sugar a nice, crisp white. It also leaves your freshly scrubbed skin feeling soft and smooth. 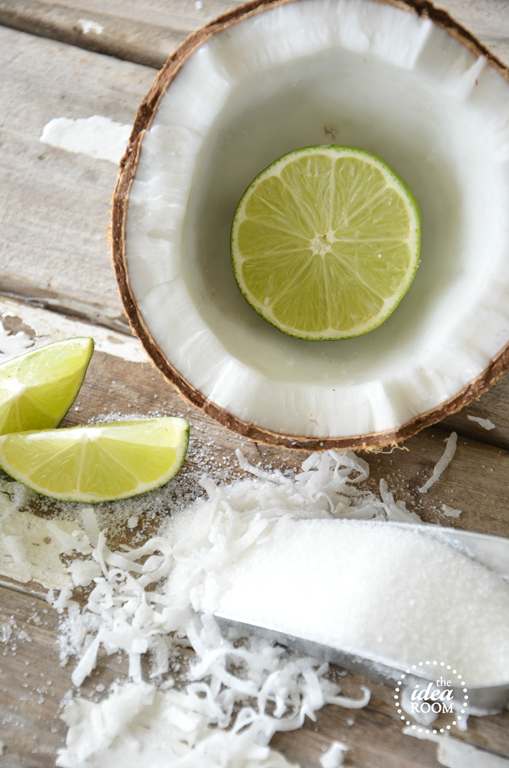 Plus, the combination of Lime and Coconut scream summer, which we are totally looking forward to at our house. I also threw in some fresh grated coconut to give the scrub a little more texture. 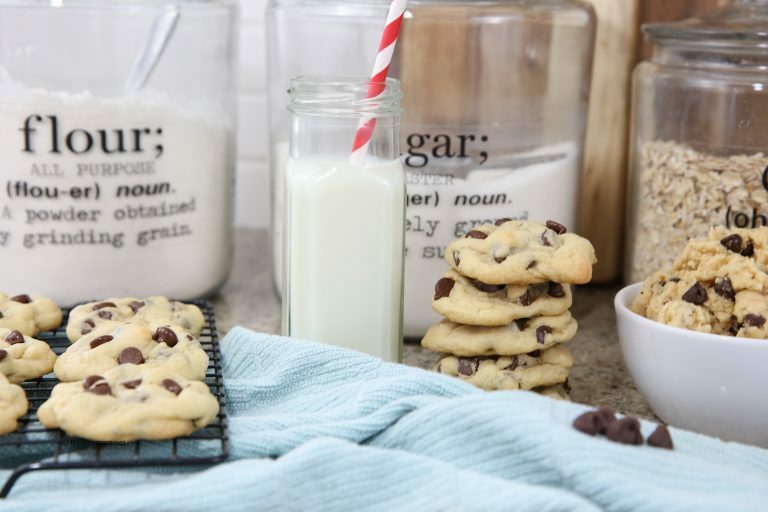 You just might want to eat this stuff…which would totally be fine since everything is edible :)! All you need is a cute jar and a label, which I am providing as a free download (see below for link) and you have a great gift for that special Mother or woman in your life. You will want to make a really big batch so you can keep some for yourself! Or if you want to get really creative, you could gift your sugar scrub inside of a coconut shell after the fresh coconut meat has been removed. Then wrap it up with a cellophane wrapper and a cute little tag. To make this Coconut Lime Sugar Scrub, you will need the following items. Melt Coconut oil in microwave. Mix in with the sugar, until fully incorporated. Add the coconut and the Lime Oil. Makes one cup of scrub. To download the Coconut Lime Sugar Scrub Labels, you will need to become a member of Idea Room. Subscribe below to gain access to our exclusive printables for Idea Room members! For a printable recipe card, click here: Printable Coconut Lime Sugar Scrub Recipe Card. 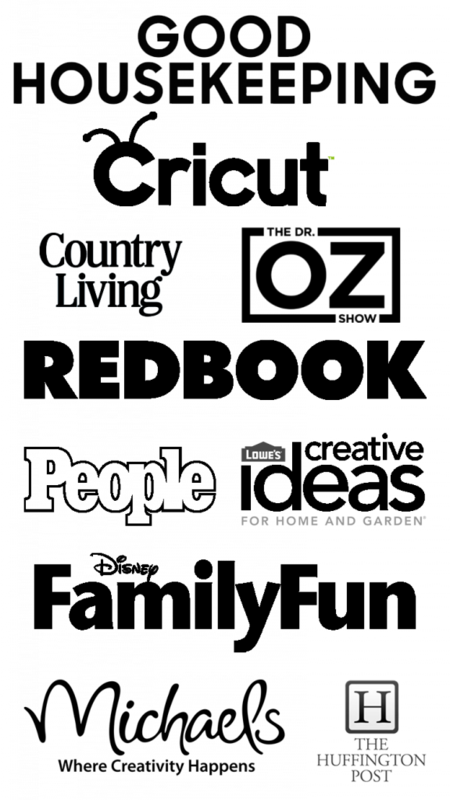 *Please do not sell or share these printables. They are created and shared her for your personal use only. Thank you. If you could create your favorite Sugar Scrub scent…what would it be? I tried your candy cane scrub, handed it out to friends from Christmas to rave reviews! I will definitely try this, ready for a little summer! Just getting acquainted with EO’s, wondering how a scrub with the oils that best deal with stress and anxiety would smell. So happy to hear that! There are some really great smelling oils for stress. Lavendar oil is good one. DoTerra’s Citrus Bliss blend is great for stress too, or use The Serenity blend. Oh yes! I do enjoy the Citrus Bliss…it smells so good! I need to try it with the Serenity Blend…good idea! I was wondering about the shredded coconut. Did you buy a fresh coconut and cut it open and use a grater to shred? Nope. Just used shredded coconut in a bag. 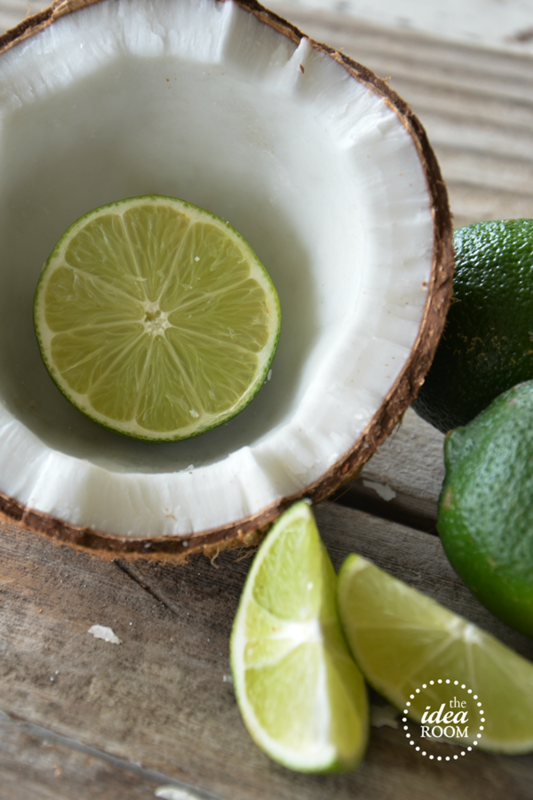 Love that you put the “lime in the coconut”! this is beautiful! and sounds amazing! nothing like some tropical fruit to get you thinking of summer! Thanks Kellie! I have summer on my mind! This totally reminds me of it. Where did you get those cute jars? Haha! Good point!! I got the taller one at Hobby Lobby few years ago. The other one is new from Bennion Crafts. Two of my favorite things! I LOVE lime and coconut! I think you’ve saved me for Mother’s Day since my mom has forbid me to spend much money on her this year. How could she resist this? We already use coconut oil for a bazillion things so we have a nice stash. I’m going to run out and get the lime oil today. Thanks! So glad I could help you out. This definitely doesn’t cost much to make. Just the initial expense of the essential oil, but it lasts for a really long time. How long does this last before going bad? Or do you have to keep it in the frig? The sugar scrubs I have made in the past last as long as 3 months. Just be sure to scoop it out with clean hands or spoon to reduce bacteria contamination. Ooooh. That does sound divine! I see you have pictures of limes, do you or can you use real limes, or is it just to show the scent? This sounds divine! Oh. MY. Do you use the scrub on your face, body..? Also, I have the same questions on Robin on how long it will keep. Thank you for sharing your wonderful ideas! You can use it all over your body. Coconut oil is great for your skin. Should last about 3 months. Have you noticed that the scrub gets hard in the jar? I made some a week ago and now it’s as hard as a rock. Any suggestions? Is it bc of the coconut oil solidifying? Darn it. I have not had a problem with this. It could be because of that or air getting into the jar. So sorry. Fresh grated coconut??!?? You’re a rockstar. And I’m sure you smell divine– please don’t take offense if I lean in a bit closer the next time I see you — which I hope is soon! Thanks for this recipe! This sounds wonderful! Perfect for summer! Sounds divine! Can hardly wait to try it. 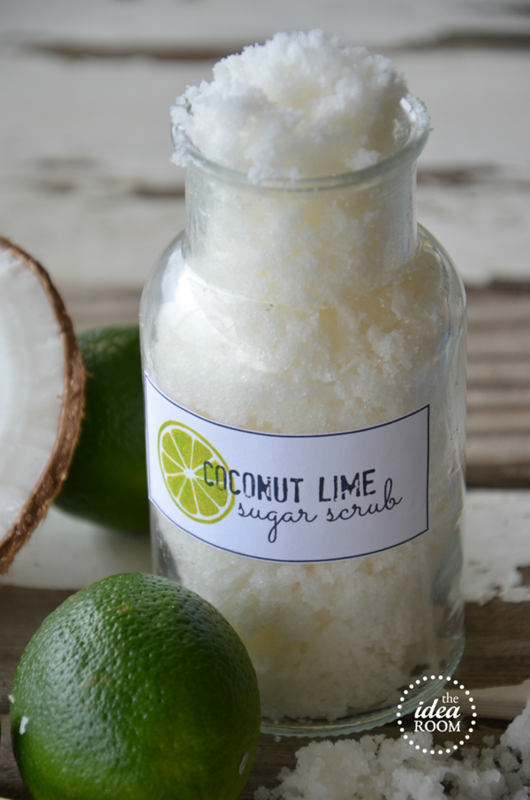 I don’t have a Facebook account and wondered if I can still get the coconut/ lime scrub tag? Thanks for always posting great blog posts! I love your blog! I can’t seem to get the link to print the label for this awesome scrub. Could you help? Here is the link. Then click on Previous Downloads. It should then take you to the labels. Let me know if you still have a problem. sounds so fabulous to have a foot rub with this! This might be a crazy question but where can you find the oil you are referring too? Not coconut oil but the essential oil? You may go over this somewhere, but how do you recommend fixing the label onto the jar? Do they make paper that’s all sticker so you can make custom sticker sizes? Or do you just print on regular paper and glue? Sorry if this is a dumb question! Not a dumb question. I just use a glue stick and it works great! There is sticker paper you can print them on to if you want to make them fancier! Quick question, does the coconut oil solidify back up after you mix it into the sugar scrub? I am just wondering how it stays soft and easy to use. I usually make scrubs with jojoba oil or even light EVO when I am in a pinch, but I love the idea of using coconut oil. Thanks so much! The oil does not solidfy hard. It looks just like the photograph days after making it still. I love that it does not clog the pores either. Coconut oil is now my new go to for scrubs! Awww…thanks Kristi! The lime smells amazing. I might be a little obsessed with it! Do you have to use fresh coconut or can you sub pre shredded from a bag? Nope! The pre-shredded will work just fine!! It is not even necessary to use the coconut. I just like the extra texture and the fun little hint of coconut it adds to it!! This is something I will be using all summer long. Us the oil 1/4 cup before or after melted? TIA! Great recipe! Can’t wait to try it this week! Measure the 1/4 cup of oil while it is solid. You can always add more if you don’t like the consistency after. I’m not sure if anyone else has asked this, but when i click on the link to get the label, it goes to a oage that dies not have a label to download/print?? Oooh I would make a mint lime or basil lime! Oh wow! I love grapefruit. I am going to have to try that combo out!! These scrubs sound divine. I think I’ll make one this weekend for myself. I think strawberry lemonade would be another good scrub for summer. Yum! Strawberry Lemonade does sound amazing and perfect for summer! I don’t have lime eo, can I use fresh grated lime zest instead? Yes! It would work great and smell yummy! Do you think rosemary and lavender would be a good combo for a sugar scrub? I was wondering does it have to be essential oil-lime or could u use fresh lime juice? LOVE! Will have to pin the other recipes as well! I am newly loving coconut oil as well- fantastic in oatmeal cookies,! Brown sugar and fig sounds delicious! Wow, I am so glad I found your blog. It looks perfect for me. I can see using most of the doTERRA oils in a scrub. I can’t wait to experiment. All of the citrus oils, lavender, citrus bliss, some of the more “manly” scents could be used for Father’s Day scrubs – I can’t wait to play in sugar! One question. I see that you use regular coconut oil for your scrubs. Is there a reason you do use the doTERRA oil. Cost, consistency? I like to use coconut oil from the store for my scrub. I like the consistency better and my doTerra coconut oil I like to save to use for my regular doTerra oil uses! That is a great question though! This sounds great! 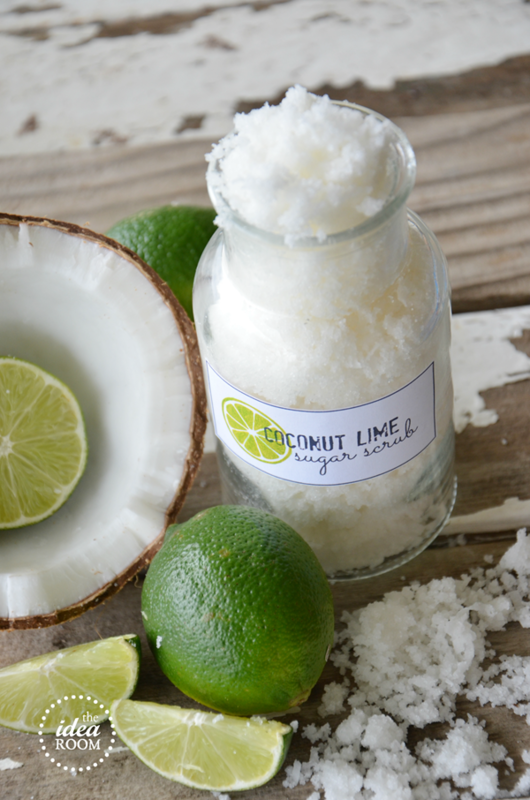 I love the smell of lime and coconut together! Oh, I like using sugar scrubs and this combo sounds lovely! Check out my blog post for another scrub recipe. I just love this Amy! I too love lime and coconut and sugar scrubs, so this combo is great. Well done on the photos, by the way. The 1/2 lime in the 1/2 coconut is great, as is the photo of the coconut shell filled with scrub. Well done! How about a pineapple coconut scrub. Pina colada is summer!! Hi! This looks great! I just wanted to put in a plug for not microwaving the coconut oil. I have read on many websites (including the one I just found below) that the microwave and/or direct heat destroys the good stuff! So, just fyi. :) Thanks! 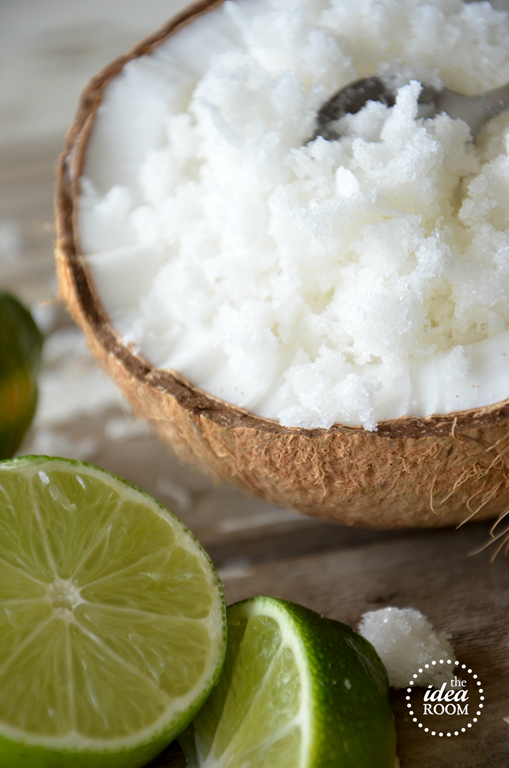 “Never melt coconut oil in the microwave or over direct heat (unless you are using it to fry or sauté). This will damage the healthful properties and destroy the good fats it contains. I love anything vanilla or cupcake scented :) How about something along those lines??? How can I get the cute labels? I would love the coconut/lime and lemon. The links don’t seem to be working??? I am very excited to make this! I just have one question. How long does this last or is there a certain time frame that it should be used by? The reason I ask is because I’ve read other homemade scrubs should be used that same day to three days, after that to toss away. Thank you. I was wondering if you could use fresh lime juice instead of the lime essential oil? Sure you can. It just will not last very long and I have found that the mix tends to turn a little brownish after a couple of days when I did a little test of it. is the coconut shavings necessary? and what if i used real lime juice and not the scent? Coconut shavings are optional. I have found you will have to use it up a lot quicker with the real lime juice and it can tend to turn the sugar a little brown and discolor it after a couple of days. You could just make a batch at a time though…enough for just a couple of days use. Great scrubs! What is the best way to store them and how long will they stay “good”? Can I use raw sugar instead of white? Raw sugar will work great. I have used that before too. It makes for a better exfoliation. I have also done a mixture! Can you use regular table sugar or do you use raw sugar? I’ve heard conflicts on this. Also, warming oils are different than essential oils for scenting these, right? Yes. You should be able to use both. I find it best to use a mix with the raw sugar though. But sometimes I just like the smaller granuales. I am not actually sure what warming oils are though. I have not heard of them before! Isn’t introducing coconut oil into your plumbing a dubious proposition? This stuff solidifies at a relatively high temp — so it’s going to build up it your drain and pipes. Same principle as bacon grease. Here in Hawaii the oils is always melted. Will it seperate when it settles? How long will a batch last? I’d love to send it via US Mail as a gift from Missouri to Florida. You should be fine to mail it with no problems! Wow, I’m just learning about scrubs. Since I am a native of south Florida, this immediately caught my eye :-) Oh how I miss tropical living!! Would like to make these and distribute them as gifts. HI! OK, first, I LOVE this! I am going to make it tomorrow. Second, I am wondering if you could help me. I have tried to make a GREAT smelling eucalyptus mint scrub (or lotion, or body butter) but I can’t get it to smell right. I am wondering if you know of a recipe for the scrub? Thanks Sarah! I have not made a Eucalyptus Mint Scrub or seen one but it sounds divine!! I want to try it now! If I get a chance I will try it and let you know! Sounds wonderful – can you substitute sea salt for the white sugar? Yes! You can make this into a salt scrub just as easily. It will give you a different result though but could be used as bath salts for your bath or as a foot soak! Wonder if you could make a candy cane? Looks so delicious! I would love to try this with pineapple and papaya to take advantage of the exfoliating enzymes in the fruit. I’d also like to try adding a couple of other essential oils especially good for cell rejuvenation too. I was looking for homemade holiday gifts and came across this recipe. I will definitely be trying it, along with a couple others! I think a chai scrub would be interesting, as would a rosemary peppermint or lemon thyme foot scrub. Just food for thought. This scrub is going to be one I make and give away..I’m looking for large batches to make and having a hard time finding recipes. Would particularly like facial scrub recipes. Thank you any any input, looking forward to hearing from you..
Hi, i will like to make and sell some of mu own scrubs, i recently make some scrubs. however some scrubs only last for a month as they melt with the other ingredients. ive been using sugar , lemon juice , honey ? any help for it to last longer? I would like to know if baking coconut, such as grated coconut could be used for texture as well as scent? What about dried herbs & spices like mint flakes? Sure! Just remember that they are degradable so the shelf life would be very short. But in small batches it would work great and be so fun! I just made this a week ago and my coconut oil solidified. Any ideas as to how to keep it soft?? I hate the idea of giving this as Christmas gifts and people having to use a butter knife to scrape it out of the jar to use. It will solidify. So if that bothers you, you can use a different oil. But I do find that if your jar is by the steamy shower, it does get soft so they won’t have to be scraping it out. As soon as it touches the warm skin it will soften as well. That is one of the down sides of the coconut oil. Can you put some lime zest into the recipe or will that be too much? No! I think that would be a great addition. I added lemon zest to my Lemon Sugar Scrub and loved it! My coconut oil does not have a scent, which is disappointing as I wanted to make coconut scented scrub (I got the white tub at Walmart…LouAnas). How can I get the scent? I have some coconut extract but I’m worried about that causing it to go bad sooner. Ideas??? i really can’t wait to start making these for family & friends !! I have wanted to try a sugar scrub for awhile now.Question-For a foot scrub or body scrub does the sugar have to be the large crystal kind or is just regular sugar ok.Also can you mix about anything with it without melting the sugar or causing a mess?Such as grapeseed oil,olive oil etc. No. I use just regular sugar sometimes, but for a fun texture difference you can use different sizes. I just made this for team gifts for tomorrow night – it is divine! I did a little variation and did two layers – tinted the lime with a slight green shade, and used coconut essential oil in the white one – it is heavenly!!! I made this today, it smells and feels wonderful. I had to add a bit more oil since it solidified on me. It’s pretty cold in Northern VA. I will be trying the others. Thanks for sharing!!! Amy! Thanks so much for your awesome site! 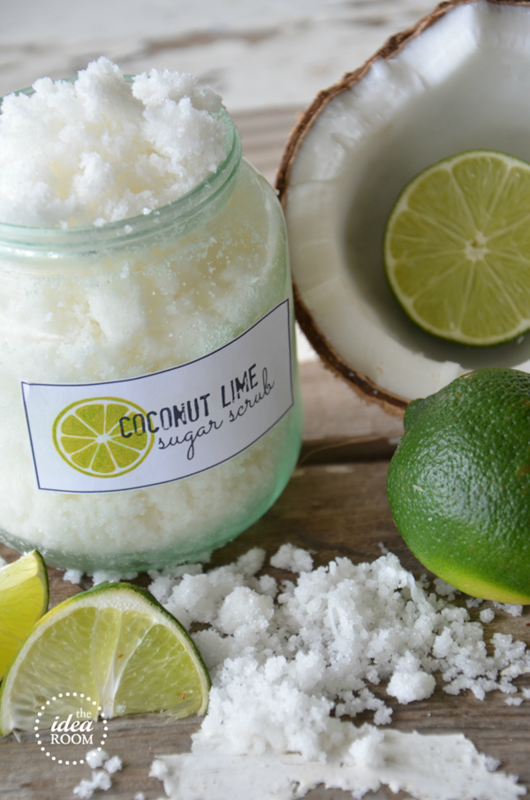 I planned to make a sugar scrub as part of my 12 yo Feb winter birthday party and I love your coconut lime ! However I can’t seem to get the link for the label to connect? Any chance you can help ? Thanks for all you give to the idea room- it’s one of my favorites! Just sent over the link!! Made a sample batch: love it! Making it as a thank you for a baby shower I’m co-hosting. Wondering how far ahead I can make this and store for the shower? Thoughts/comments? 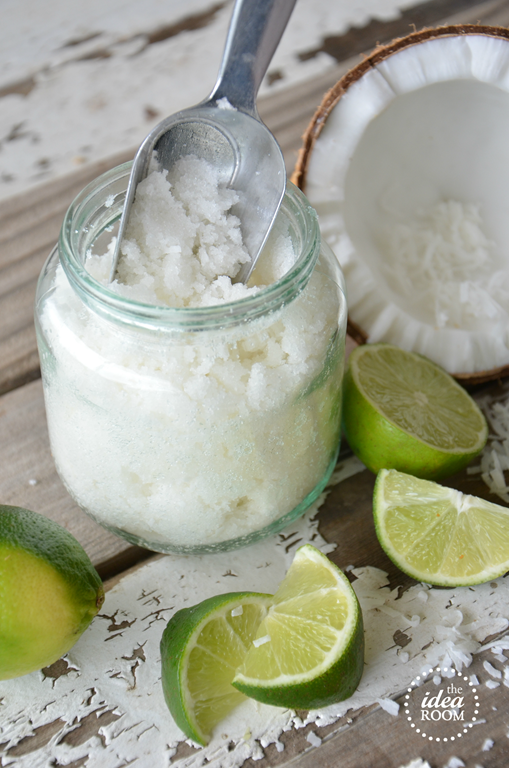 Coconut lime sugar scrub they will make skin soft? Cellulite included? All body? Face? Finally something I can do with the white sugar I no longer ingest. This looks like it will be heavenly. What store can you find the lime essential oil ?? What do you do about the whole pieces of coconut shred does it just dissolve away into tiny prices because it could stick and wrapped up on the drain. So what I’m asking is like what the coconut feels like in the sugar scrub?? Made this for mother’s day on Sunday and it was so easy. The scrubs smells amazing! Since I had a little leftover I tried it out on my own skin (I’ve really dry and sensitive skin) and it felt really good. My face is incredibly soft now. Thanks for that wonderful idea. Does the sugar dissolve in the coconut oil? Do you wait until it cools off a bit first? Awesome idea, thanks! Hello I just love your label for the coconut lime sugar scrub. It’s too super cute! Thank you for posting this project. I can’t wait to try it I am so excited about it. Although I have a question. I am not on facebook. (I know I am probably one of the only people on the planet who does not want a facebook account.) Would you be willing to email me a PDF of your labels please? I am sure you are tired of people asking for your label. But I think it is so cute! I am not on facebook. How can I get your label for my scrubs? Also, in reading some of the comments, in your directions you say to microwave the coconut-but someone posted that you shouldn’t?? so do you have an answer on this? I would also like to ask if using a mix of raw and white sugar would be best? (or is it white sugar for the color?) Sometimes reading the comments makes things a little more complicated for me. 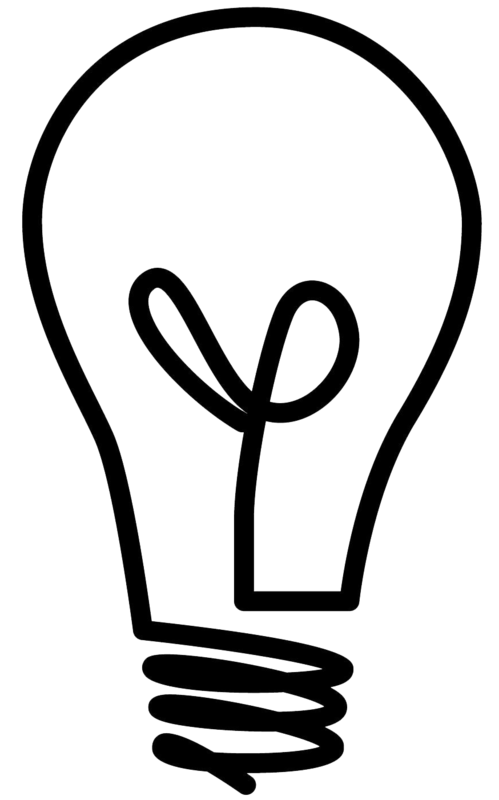 Keep up with the great ideas. I have pinned several of yours. I do like your style! Can you use something else than lime Oil? Sure! You can use whatever essential oils you love! This sounds fab, really want to give it a go, I was wondering I have some oils/fragrance that I use to make homemade soap would these work just as well as essential oils? Εveryone loves ѡhat you guys tend to be սp too. This sort of clever ѡork and exposure! guys to mу oown blogroll. What exactly does this do for the skin. ??? I am making some of these for my moms birthday next week. The doterra oils are pretty expensive and I don’t have time to wait on shipping. Would extracts work just the same or would they ruin it? On the FB page you will see “Get your free Gift” Click on that and then click on “Idea Room’s Previous Downloads” Hope that helps! How long can I keep it for once its made? Do I have to refrigerate this or anything? Stupid question, I know, but I’m just wondering because sugar can grow mold and etc. You should be fine if it is kept in an airtight container for up to 3 months and you are careful not to introduce any bacteria when scooping it out. Always use a scoop or clean hands! Juices, fruits, hydrsols,honey or other botanicals or food items should never be used in a scrub without a preservative. And also should NEVER be kept in the shower or allow any water to enter the product. This is how yeast,mold and other nasties grow. Even though you can not see it it will begin to grow immediately! This can cause staph and blood infections that could prove to be deadly. How long would these stay good for? Once made. They should last up to 3 months in an air tight container! I’m so glad I’ve found your blog. I’m absolutely loving it !! 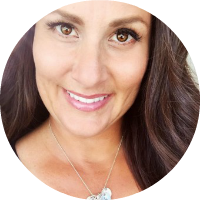 Iwill definitely use many of your ideas Thank you for sharing them .And it seems like lots of my friends will get sugar scrub this Christmas :) I just got one question: is there any particular reason you using doterra oils. In my country they are extremely expensive and I was wondering if I can use any other brand I’ve found on ebay. I use the doterra because they are food grade and the highest quality. They are pure and not watered down which is why they are a bit more pricey. But you only need to use a tiny amount so they last a long time. Do u use refined or unrefined coconut oil? Ca you do a salt scrub using this same recipe? Thank you for all the wonderful ideas! I love your scrub recipes but am having a problem with using coconut oil, as it hardens so much it’s even hard to get it out with a spoon. I’ve tried adding olive oil, but that changes the color dramatically. Maybe I’m adding too much. Do you have any recommendations for softening the scrub but preserving the white color? Thank you! Yes…that can be a problem. If your coconut oil is too hard and you can not find a softer version or a more liquid option for coconut oil, or you live in a cold place :) You can substitute coconut oil with almond oil. It has a lighter color and should work just as well for you…while staying soft! The coconut oil does that. Some are worse than others for the hardness. Once they are warmed up, the sugar scrub will soften again. They can warm them slightly in the microwave if needed, especially if they are in a very cold climate. I actually just print it on regular white paper, cut it out and then glue them on with a regular glue stick! It works so great and is nice and smooth just like a sticker! This will be amazing! About how much of each ingredient did you use for making a batch? Hi! This idea seems amazing and I would love to try it! I’m pretty sure someone already asked..but I couldn’t find quantities for the recipe.. how much sugar, coconut and coconut oil should I use? Thanks! Hello im wanting to make this for my Mom for Mother’s Day, but for some reason everything is showing but the actual instructions. Hey :D just found your site! On the coconut lime scrub, do I just mix all the ingredients & done? I seen a list of ingredients but nothing on what to do, also didn’t see how much to use of each item. Thanks bunches! The pics really do make u wanna eat some! I was just wondering how long the scrub was good for? Is it just me…. I can’t find the recipe for this. I see the ingredients but that’s it. Help. 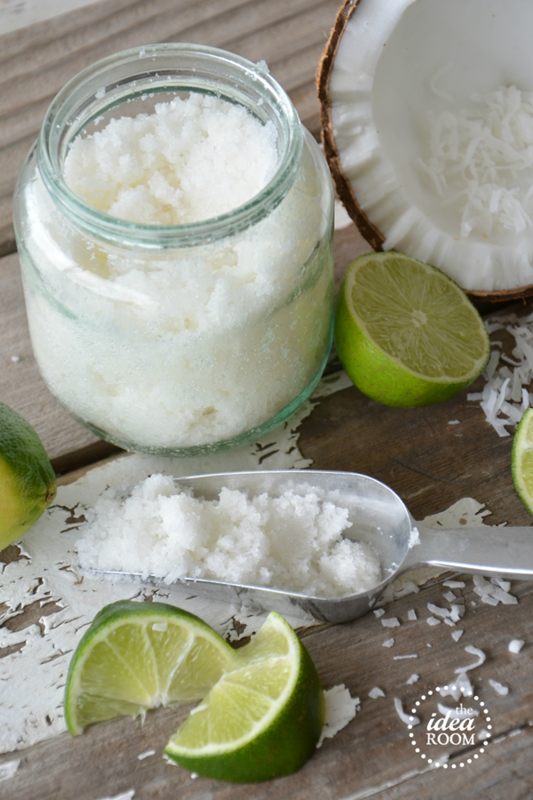 What are the quantities of each ingredient needed to make the coconut and lime scrub please? For some reason I can’t find it on here. Hi! Has anyone ever used a different essential oil? I don’t have any lime, but I do have Lemon!! Id love to try this and wondering if anyone tried with it lemon? Hi there, just wondering how you store your scrubs, are they okay to stay in the bathroom? Will they still keep around 3 months if stored that way? Thanks , very keen to give it a go for gifts ! They will be store fine in the bathroom in an airtight container. Just make sure your hand are clean when you getting it out. Bacteria can grow in it if your hands are not clean. Enjoy! I have issues with sugar scrubs (they tend to turn into yeast infections even if really well rinsed) Could this be done as a salt scrub? Nicole, you can store the scrubs up to three months in an airtight container. Just make sure to wash hand before using so you do not contaminate the scrub. Hope this helps. Thanks. Cotton candy sugar scrub?? I’d love to try that if you have. My daughter loves the smell of cotton candy. Just ordered by ingredients. Can’t wait to get started! It smells delicious and works great. Enjoy! Thanks for sharing. Please link it back to my site. Thank you. 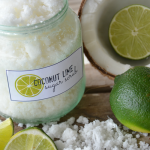 I am working on making the coconut lime scrub and wanted to print recipes cards. However, the recipe card is for coconut lime sorbet. Is there another link you could give? Thank you!!! How long do these scrubs last? Whats the shelf life? 3-4 months as long as you keep your hands clean when using them, so there is no cross contamination. Can sugar scrubs be used on the face? I don’t recommend it. It may be a bit to harsh for facial skin. I am sure it would be fine! Enjoy! Where do you buy the jars? Sherry- You can get them at your local craft store. Thanks. The lime sugar scrub looks so good. What is the best way to use it? Stacey- I just use it on my feet and legs. It is wonderful! Amy- Up to 2 months in an airtight container. L.R.Y- You can refrigerate them if you want, but not necessary. They should last about 2 months. Enjoy! 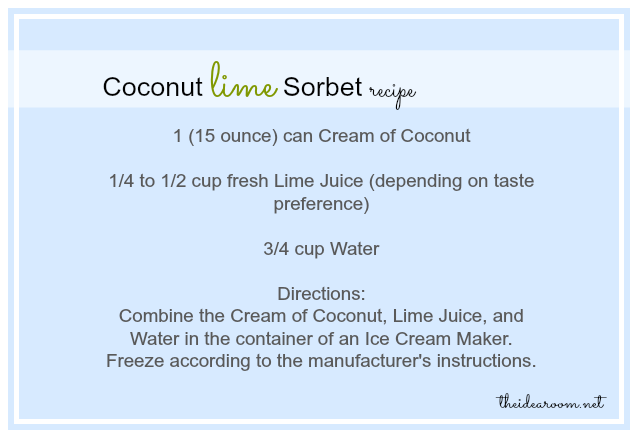 The recipe card attached is for a sorbet, not the sugar scrub. Since we liquifying the coconut oil, could I just use the fco from doTERRA? Jessica- I will have to look into that. Yes, you can use fco from doterra. That should work great.